Met her in Manchester in 1976 Natalie actually delayed going into the studio for over fifteen minutes just to talk to me. 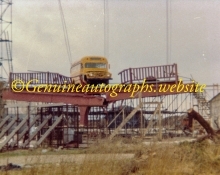 During that time I obtained an amazing four autographs and she allowed me to take her photograph. She was particularly interested in a film book which I took with me for her to sign (that is what she is holding). I had a number of questions in relation to her film roles and she was kind enough to answer them all. It was almost like doing a private interview. For an autograph collector it really doesn't get any better. A lovely lady with no ‘airs and graces’. Following performances of ‘Photograph 51’ in the West End she was happy to chat, sign, and pose for ‘selfies’ at any time. I have waited hundreds of times for stars who never sign after a performance, and yet here was a lady who seemed determined to meet as many fans as possible. I have sadly never met her ex- husband, Tom Cruise, but he has a reputation for being the same with fans. Maybe it runs in the family? On 29/10/11 I attended my local gym where Dame Kelly Holmes invited everyone to take part in her fitness challenge. It was an exhausting routine but I'm glad I did it. Afterwards, she was happy to sign any autographs I wanted, three in all, and allowed me to have my photo taken with her holding her Olympic Gold medals. Other celebrities should learn from her as no charge was made for the event. Her reward was motivating people to get fit. 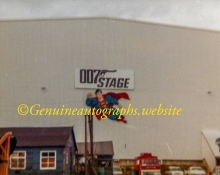 I was very fortunate indeed to be at Pinewood Film Studios during the making of the first 'Superman' film in June, 1977. 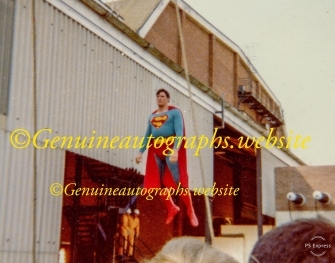 Not only did I obtain Christopher Reeve's autograph but he gave permission for me to take photographs while he was filming. 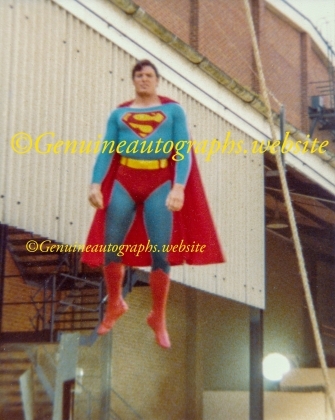 We chatted in between filming about the physical challenges he faced to get ready for the role. He was a gentleman in every respect and certainly knew how to treat his fans. 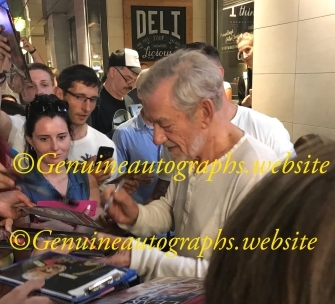 Here he is signing after a performance of ‘King Lear’ in the West End. I must point out that he was mobbed by fans who acted quite disgracefully, and yet he was polite and professional. 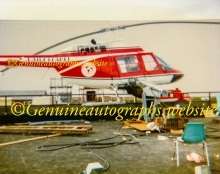 He maintained a ‘one autograph per person’ policy. I was particularly impressed the way he took time to explain why he wouldn’t sign any ‘Lord of the Rings’ merchandise as opposed to just ignoring the many requests.